Toronto currently has the greatest number of high-rises and skyscrapers being constructed in North America, significantly surpassing all other major cities. According to data collected by Emporis, a global building information database, the city currently has 147 high-rise and skyscraper projects being constructed. Inspired by Scandinavian architecture, the Arborescence development in Québec will be built with natural materials. 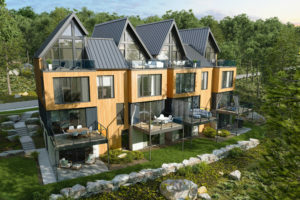 KnightsBridge is developing a series of condominiums on Bromont Mountain’s Kamloops Trail in Québec. The eco-friendly project titled Arborescence is aiming for the Leadership in Energy and Environmental Design (LEED) certification and will be built in various phases, for a total of 260 units. The first phase will have 48 units and be delivered toward the end of 2019. The investment is evaluated at approximately $100 million. With streamlined Scandinavian architecture, each unit will be built with natural materials and feature a gas fireplace, 3 to 4.5-m (9- to 15-ft) ceilings, superior soundproofing, and expansive windows to put the focus on nature. In addition to unobstructed views of the Eastern Townships, Arborescence will offer a range of amenities such as heated outdoor pool, hot tub, pond with dock, tennis and beach volleyball courts, and an outdoor fireplace. ABCP Architecture has designed the development.